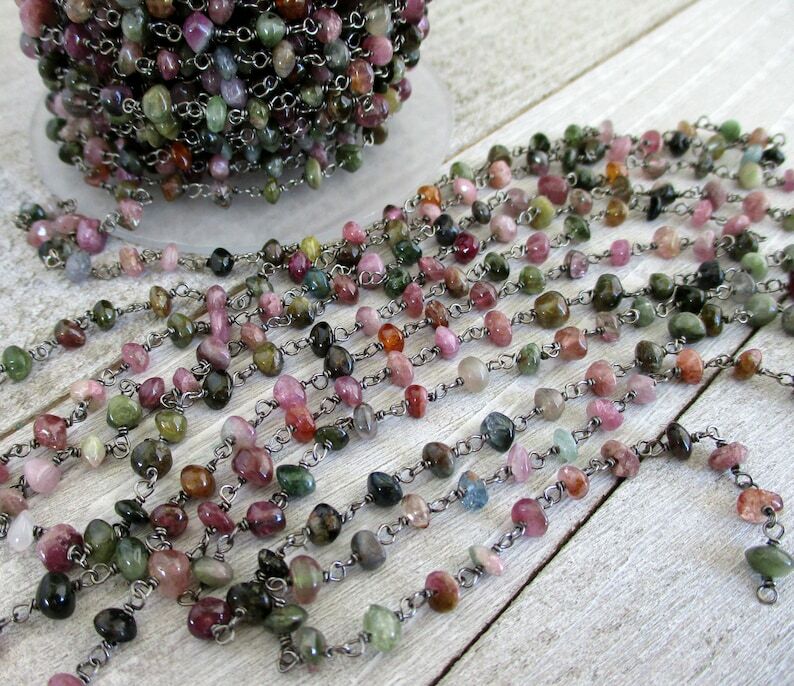 This Tourmaline Rosary Chain has 4-4.5mm stones in lovely green, pink and brown tones. The brass is plated gunmetal chain. This chain makes gorgeous ankle bracelets as well as necklaces and I offer it by the Foot. This chain has about 4 beads to the inch. The mannequin display is smaller than an actual person. THIS IS BULK CHAIN AND DOES NOT INCLUDE A CLASP - but I do sell gunmetal findings - see the link below. Chain is imported from India. It ships from USA. Photos taken by me in natural light on a neutral background. Colors are accurate on my computer monitor, but there are variations in how screens show color. This is SO PRETTY. Got some in the past and had to get some more! A little darker than expected. The photo showed lighter stones. But they are nice. I absolutely adore this chain. The Tourmaline stones are so lovely.